All transactions are safe and secure with a reliable history in online purchasing behind each of our associates. Buy the 24 - Day 9 t-shirt to own 24 clothing and merchandise. 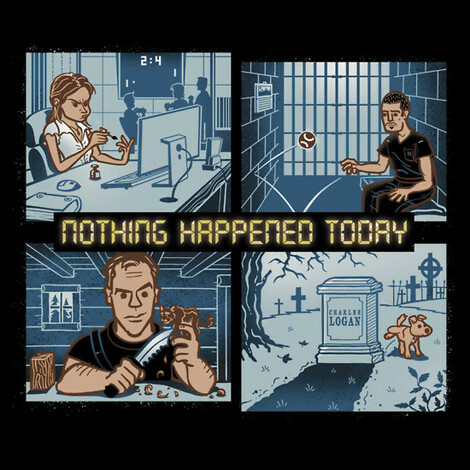 The front of this humorous tee displays the phrase, "Nothing Happened Today", imagining what the characters are doing on Day 9 after the series concludes. Since each of the eight seasons features 24 episodes with each episode covering a single hour of a day, this Jack Bauer 24 t-shirt reveals the boredom that engulfs Jack Bauer and friends when people are no longer watching. In addition to the 24 - Day 9 tee above, browse the 24 Clothing Gallery for more apparel like men's and women's clothes, kids shirts or hoodies.